In the 1960's the Council demolished the picturesque Almhouses and post office which were the centrepiece of the village, adjacent to St Peter's and Sowerby Hall. In their stead was erected a row of six brick-built shops with living accommodation above, which were totally out of keeping with the rest of the area. 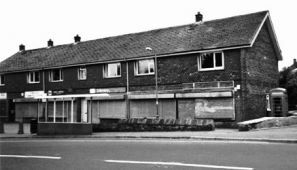 Over the years, Calderdale MBC and Pennine Housing failed to maintain the shops so that they fell into disrepair. Several had long been unoccupied and so had become a magnet for anti-social behaviour including vandalism. Many residents, outraged that for so many years the heart of our village was hideous and ugly, joined together to make the Sowerby Residents' Association. The first task was to tackle this eyesore, but now the well-attended meetings, at the Church Stile Inn, enable everyone in the area to voice their concerns and to work towards solutions to local problems. For the next meeting please see the Events Page. Click here for the minutes of the last meeting.